Dr. Oz will be the first to tell you there are no short cuts when it comes to losing weight — and keeping it lost. There is no secret formula to help you lose 50 pounds in a week or drop from size XXL to S overnight. Crash diets do not work! Losing weight in a healthy manner is about making the right choices and applying the right strategies to reach your ultimate goal — optimal health. 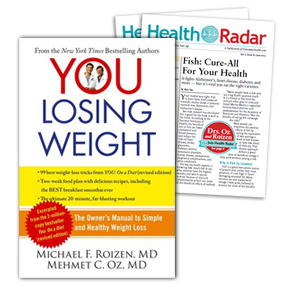 Dr. Oz's You: Losing Weight, co-written by Dr. Michael Roizen, provides a simple weight-loss program that discusses body basics, nutrition, activity, mind, lifestyle, and more. The book includes an easy-to-follow 14-day diet plan in which you still get to eat and eat well (three meals and two snacks daily)! You will also enjoy 99 tips and practical strategies to help you get in shape, keep that shape, and achieve the overall healthy feeling you've always wanted. You've always talked about losing weight — now's the time to do it! It's time for you to implement Dr. Oz's no-nonsense approach to finally winning the battle of the bulge, and You: Losing Weight is where to begin. With nutrition tips, food plans, incredible recipes, and comprehensive advice on the science of weight loss, this priceless paperback is packed with everything you need to know to keep the pounds off . . . forever. Diet smart not hard with Dr. Oz. This pocket-size paperback is packed with what you need to know to keep the pounds off for good.